Visual D can help you converting your C++ code base to D. Even though it is capable of some quite extensive reorganization of the code, don't expect to get compilable and runnable code out of the box. Helping the converter with additional replacement rules and manual additional editing of the result might be necessary. convert/expand preprocessor directives, so that the text is no longer a mixture of two languages. Conditionals are replaced by constructs that should fit into a tree hierarchy similar to "static if" in D.
You can invoke the C++ conversion wizard from the Visual D menu. Convert: Input files/Current document/Current selection. When selecting "Input files", a whole source code base can be converted, writing files to the output directory. Otherwise, the text in the editor is replaced. If you have not changed the text and selection after the last conversion, redoing the conversion will use the initial code to better allow tweaking options. Files and directories: filename pattern to include into conversion, prefix with '+' to recurse into subdirectories, prefix with '-' to exclude files from the list of files specified so far. Source code header: header to write into output files. The identifier MODULENAME is replaced with the module name of the generated D file. If it is not specified in the header, a module statement will be prepended to it. Output dir: the directory where to write output files to. Write intermediate files: To debug problems during the conversion, intermediate files can be written to sub directories "pass1" (after the proprocessor handling) and "pass2" (after the code reorganization, but before the final replacements). Preprocessor expansions: only the preprocessor identifiers given here will be expanded. All other preprocessor directives are translated to corresponding D code. If no assignment is given, the first definition within the input source code is used. If preprocessor conditionals are expanded, only the active code path is written to the output file. Version conditionals: normally, preprocessor conditionals are translated to "static if" conditions, but if an identifier is specified here, version conditionals are used. If you want to span the rule across multiple lines, use the \ line splicing mechanism. Value/reference types: sometimes the parser or the converter stumbles across unknown identifiers that might be types. You can help it specifying them here. Value or reference semantics determine whether an indirection is removed from pointer declarations. Keyword prefix: identifiers that are keywords in D, but not in C++, are prefixed with the given text. When using the converter on the current selection (there is also a command VisualD.ConvertSelection that you can assign to a keyboard shortcut) you should select complete declarations, e.g. variable or class declarations and functions. Otherwise the parser will stumble. This tool is the result of generalizing an attempt to convert the dmd front end code to D, so please don't be surprised to find some unexpected special casings from time to time. The result of that attempt was that the converted code was parsable, but did not pass all semantic stages. You can pass a config file to the converter that has been saved by the wizard dialog. If you pass files to the program, file specifications in the configuration file are ignored. 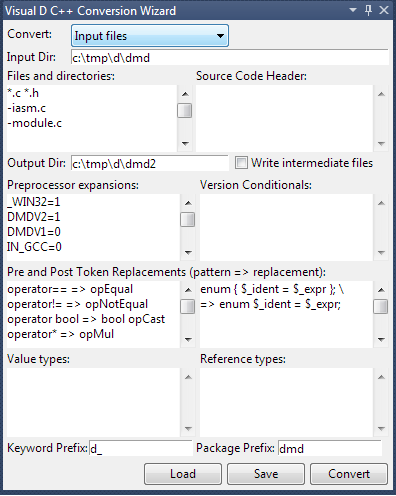 See here for an example of a configuration file to get started on converting the dmd front end. Move member and field implementation into class declaration. It can deal with a number of complicated uses of preprocessor conditionals, but they can get much more difficult to read.